If there’s one topic that seems to make riders foam at the mouth, never mind horses, it’s bits and bitting. I’m certainly no expert in bits or fitting them, but I’m constantly shocked by the approach that some people take to this. A selection of snaffle bits, including cherry roller, loose ring and Fulmer. I’ve seen dozens and dozens of riders who ride in certain bits and even recommend them to others, all without any idea of how the bit is designed to work, or what is actually happening when they use the reins. I’ve heard people say, ‘Oh, if you can’t stop him, it’s time to move up to a stronger bit. Try a Pelham/gag/Dr Bristol etc’. There’s a lovely old saying about this – unfortunately I can’t find the exact quote (just wasted lots of time looking for it when I should have been working), but it’s something like, “Out of every 100 bits, one is made for the inside of a horse’s mouth, and the others for the inside of a man’s mind.” Inappropriate bitting is never a good idea – your horse will be uncomfortable as a result, and probably much harder to stop. It’s well worth getting a bit properly fitted by an expert – it could save you a lot of frustration. There are hundreds of different types of bit, but they can be grouped into three rough sections – snaffles, curbs and combination. 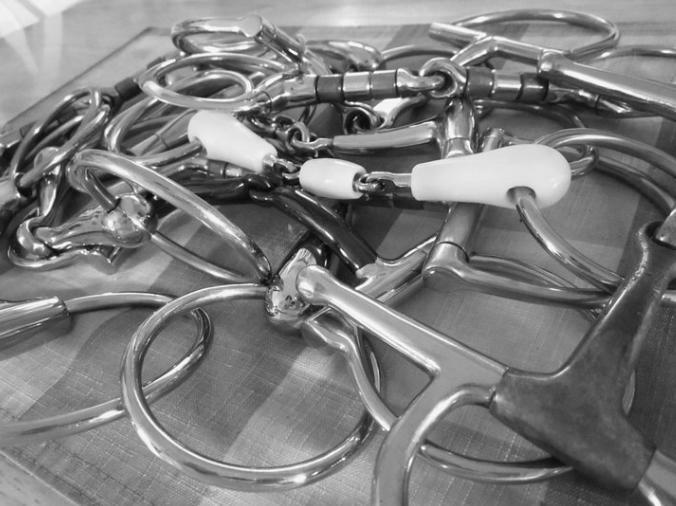 Snaffles are the biggest and most common group, and include straight, jointed and mullen mouthpieces. The most commonly seen pure curb bit is the Weymouth bit, used as one of the bits on a double bridle. The third group – the combination – is becoming increasingly common, and includes Pelhams and Dutch gags. Personally, I’m not a huge fan of combination bits, which are designed to be a cross between a curb and a snaffle – I don’t think they do either job particularly well, and don’t allow you to be very subtle with aids. Just like humans, horses are all individuals. Some horses have large, fleshy tongues, and hate a jointed bit as it digs in. Other have high roofs to their mouths, or sensitive lips, so one bit really doesn’t fit all. Snaffles are generally understood to be mild bits, but some horses will find them very uncomfortable. Remember that a jointed snaffle has a ‘nutcracker’ action, and if your horse has a particularly high head carriage, you could be exacerbating this by squeezing his head up every time you use the reins. In choosing a bit, you need to take into account the conformation of your horse’s mouth, his age, level of schooling and the type of work you want to do with him. If you’re having problems with your horse’s brakes, or other behavioral issues, a stronger bit is unlikely to be a longterm solution – your horse will just get stronger and stronger in response, until you need to go up another level. Then what? Barbed wire? Razor blades? Instead, think about what’s causing the problem. Get your horse’s teeth and back checked to make sure that his issues aren’t pain related, then book a few sessions with a good instructor – chances are that if you improve your horse’s balance and co-ordination, he won’t need to lean on the bit anymore. If this doesn’t work, go back to basics – get back on the ground, try a milder bit, and teach your horse how to accept it using inhand techniques (ask an instructor to show you, if you’ve never done this before). Some horses never take to a bit at all, and are happier in a hackamore or bitless bridle. Remember you should always try to use the mildest bit you possibly can, and then you always have the option of going up a level for special occasions such as cross country rides. With the huge selection of bits on the market, there’ll probably be one to suit your horse – but it’s worth putting some thought into choosing it. By the way, if anyone’s interested, I use a Myler comfort snaffle on Blue. 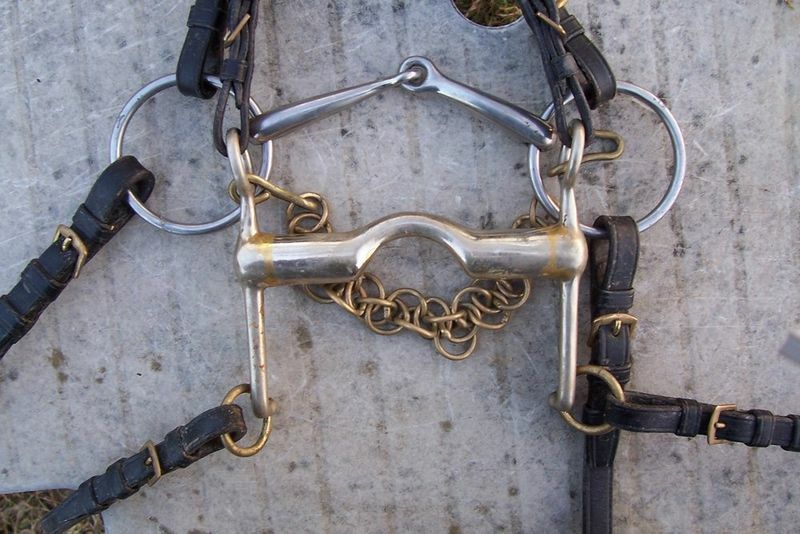 These are American bits (although they’re freely available in the UK), and I believe they were originally designed for neck-reining, as both sides of the bit move independently, unlike a traditional snaffle. It’s comfortable for Blue’s small, neat mouth, and I love the sensitivity it gives me. It’s been a hard slog, but this is definitely the bit that works for us. It’s not a cheap option – mine cost around £80 – but has been a great investment. ← Horse riding gadgets – help or hindrance?